This past weekend, I took a trip to Tokyo to visit my brother. We had a great time walking around the city streets, taking in the all the sights and sounds of a bustling metropolis. My brother and I love to people-watch and drift in and out of shops at our leisure, but our most favorite thing to do is eat. There’s no doubt about it, my brother and I are gluttons. We ate our way through Tokyo, enjoying everything from Middle Eastern food to more traditional bowls of ramen. I think one of the highlights of our culinary tour was our stop at the Dominique Ansel bakery. Dominique Ansel is a New York City pastry chef who invented the “cronut” back in the early 2010’s. What is a cronut? It is basically a pastry that is a croissant and donut fusion. It’s chewy, sweet, and beautiful to look at. 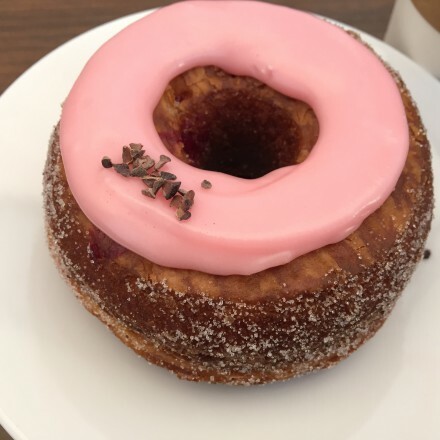 We were lucky enough to grab a raspberry and praline flavored cronut. It was delicious! I don’t normally like donuts, but these special treats are definitely an exception for me. I can’t wait to go back and get another one!